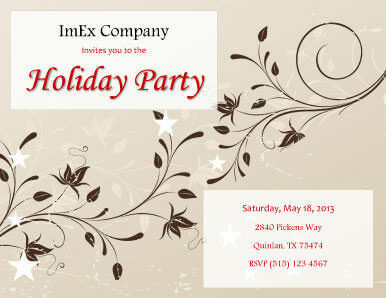 Do you want professional-looking invitations for your party, but don’t have the design skills to match? All you need to do is download our free printable party invitation templates and customize the content to create beautifully designed invitations for your special event. Scroll down to find 26 editable party invitation examples you can use right now. 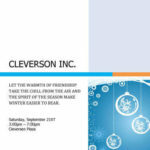 Purpose – Make it clear to your guests what event the invitation is for. Are you hosting a pool party, or are you inviting your employees to a Christmas party? 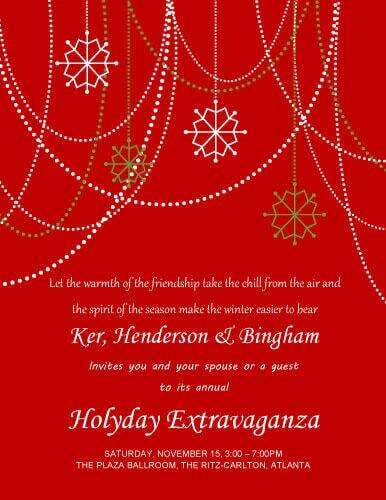 Whatever the event, use a large font and a contrasting color to the background so that it stands out on the invitation. Name of honoree and/or host – If you are creating an invitation on behalf of someone else, you may wish to include their name as the host. This may also be the case for a club party or corporate party invitation. If the party is for a specific person, e.g. 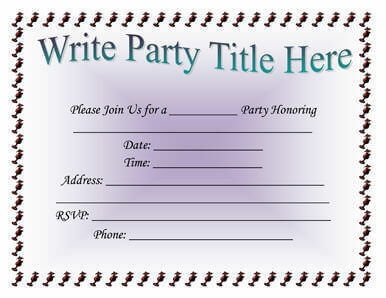 you are inviting guests to a birthday party, make the honoree’s name pride of place on the invitation. Place – When sending out invitations, you want to provide the correct information to help guests find the event easily. Many cities have similar-sounding street names, such as Sycamore Road, Sycamore Avenue, Sycamore Court, etc. so it’s best to provide the full street address including city, state and ZIP Code. If the event location is potentially difficult to find, consider including the name and phone number of the venue. If your party is being held in two locations — perhaps you’re inviting family to the graduation ceremony at the college and back to the house for the celebration — make this clear on the invitation. Dress code – If there is a specific dress code for your party, spell it out for your guests. Whether it be a black-tie corporate event or a princess-themed birthday party, giving instructions well in advance will ensure that guests are wearing the correct attire and that nobody is left out of the fun. 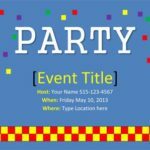 Generic party invitation: You’re invited! Please join us to help celebrate [event]. Halloween party invitation: Come and join us if you dare. You’re invited to a Halloween scare! Retirement party invitation: We invite you to join in the celebration of [name]’s retirement after [number] years! Housewarming party invitation: The scenery has changed, and the address is new, but our door’s always open to family and friends like you. Please stop by and see our new home! Block party invitation: Meet, greet and eat with neighbors at our first annual Summer Block Party. Summer party invitation: Come dressed in Hawaiian. The theme is set. We’re throwing a luau you’ll never forget. Birthday party invitation: We’re blowing up balloons and icing the cake! There’s a big birthday party that we hope you can make! Baby shower invitation: They’re expecting a baby, a new bundle of joy. A very special gift, be it a girl or a boy! Valentine party invitation: You and your valentine are lovingly invited to a Valentine’s Day Dinner Party. Going away party invitation: [Honoree’s name] is leaving to set sail on a new adventure. Come along and wish [him/her] well as [he/she] embarks on [his/her] journey. Pool party invitation: The sun is hot, but the water is cool. Join us for a summer party by the pool. 1920s party invitation: [Honoree’s name] is turning 30! Let’s help [him/her] say goodbye to [his/her] roaring 20s. Costumes are a must! Bachelor party invitation: [Honoree’s name] is tying the knot! Join us for one last evening of fun. Vintage tea party invitation: You are cordially invited to attend a ladies’ afternoon tea. Tea hats and pearls encouraged. Garden party invitation: The table is set and the garden is ready! 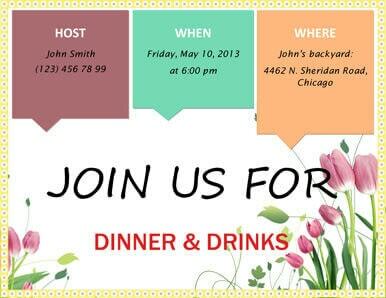 Please join us for our first annual Garden Party. 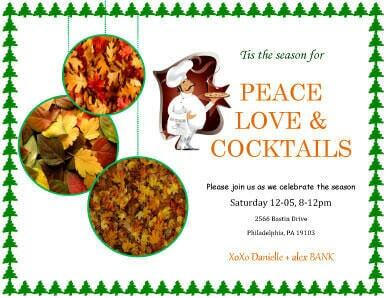 Christmas party invitation: Christmas comes but once a year; let’s get together for some holiday cheer! You and a guest are cordially invited to our Annual Christmas Party. Video game party invitation: Game on! It’s time to take fun to the next level for [honoree’s name]’s birthday. Learn also how to customize your cover letter. For more ideas, Invitation Consultants have hundreds of invitation wording samples for almost any party or event you can think of! Pressed for time to create an invitation? 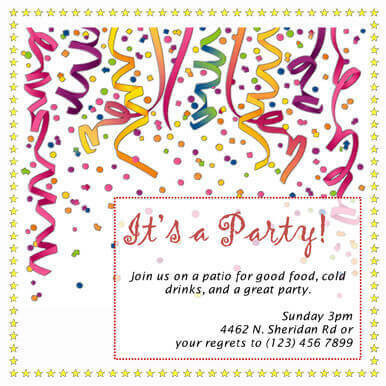 Not sure how to design a party invitation? 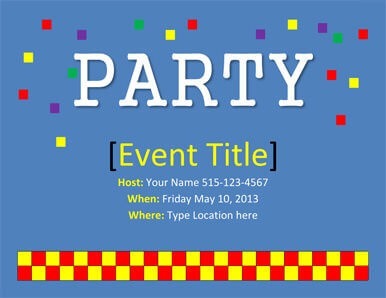 Download one of our free party invitation templates, all professionally designed in Word. Whether the invitation is for an informal event such as a barbecue or pool party, or a more formal gathering like a baby shower or wedding, our templates make it easy to create eye-catching invitations without the need to spend hours crafting them. Because the templates are formatted for you, you won’t have to figure out where to place the personalized information or graphics, or which font would work best. The entire process is streamlined to save you time, while still giving you the creativity to make your invitations feel personal. Simply select the template you want and customize the key elements.Templates below are generic and can be customized to suit most events. For more specific examples, check out our Christmas Party Invitations, Kids Party Invitations and Birthday Party Invitations. 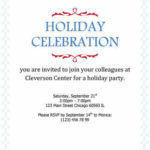 The pleasure of your company is requested to celebrate the holiday season. When designing a formal invitation, it is best to choose a neutral color palette and use classic, traditional imagery. You should also use a font type that brings a touch of elegance to your design. 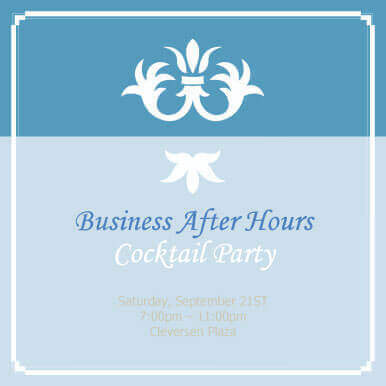 Invite colleagues, employees, well-wishers and partners to a Cocktail Party or another business event with this free printable invitation template. 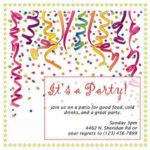 This free invitation is designed using different text sizes and colors. Easy to edit, easy to print. Invite your clients, colleagues, associates with this red invitation card. Created with Word shapes and fully editable (no images). 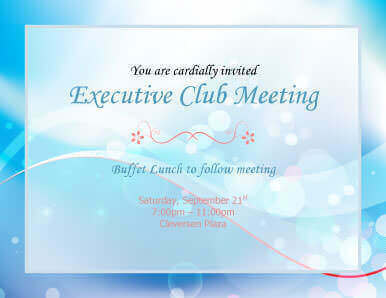 Abstract design with blue background and large message box for invitation text. Dark elegant design that will be perfect for any event with performance. Garden party invitation design with subtle colours and an image of flowers. Game-like theme that can be used for different occasions. The yellow backdrop presents a creative design for a creative party! 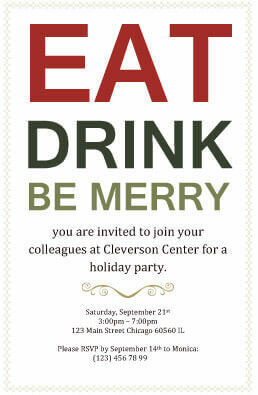 This email-style Christmas party invitation is great for an office Christmas party. You’re invited to an [event type] for family and friends. Come and celebrate with us! We’re hosting a [party type]. We hope you’ll join us! Please join us for an evening of drinks and dancing. 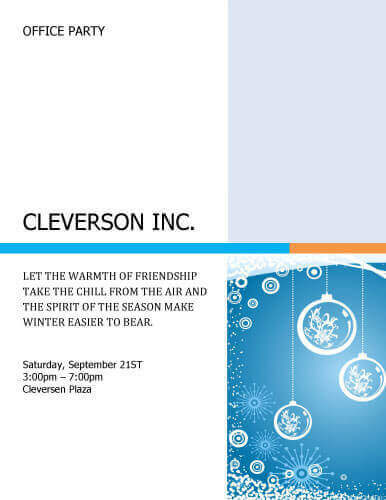 With this type of event, you have a lot of freedom when designing your invitation. This is your chance to use bold colors, fun fonts and eye-catching images to suit your event. Another floral design with red color theme and flower heading. Grunge design that can be used for an invitation, flyer, notice, memo, or other purpose. 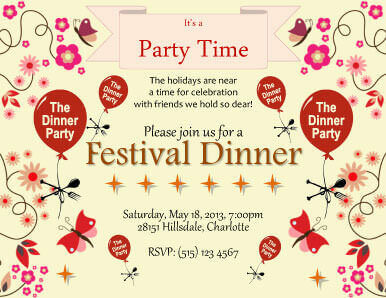 Design for season celebration party, company barbecue, or business lunch / dinner event. Flowers, butterflies, ribbons, stars, balloons, and ornaments: creative cheerful party design. Simple floral design with two text boxes. 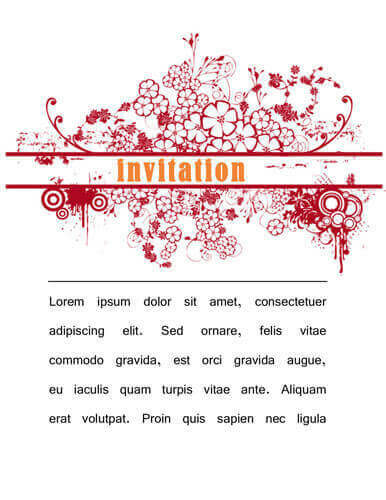 Simple design with floral pattern background, the word “Invitation”, the invitation details (fields “to”, “cc”, “from”, “date”, “regarding”), and the card message. You can remove some fields to make the template less formal. Invitation card template with green floral design, an abstract theme with beautiful swirls and butterflies. Simple green template with a copy space for your text. Use this template to invite people to a garden party, spring party, or a barbecue. Very simple invitation that can be used for pretty much any occasion. Change text, add your own image. 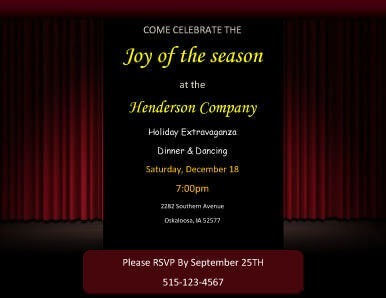 You’re invited to an evening of laughter and good cheer at the office holiday party! It’s that time of year again! 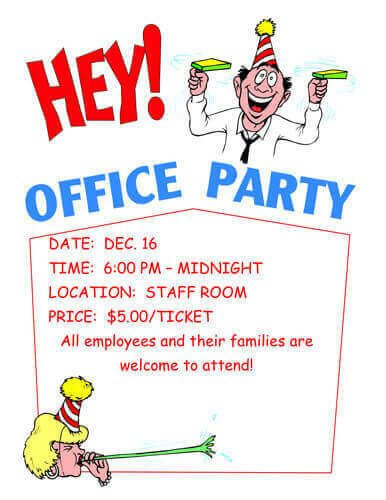 [Company] invites you to the annual office Christmas party. To celebrate another great year, please join us for dinner, drinks and holiday cheer. Neutral and elegant corporate style theme. Replace theme image with your own to create unique design. Simple text-only invitation with checker border. Soft pastel should be changed to something more attention-getting and catchy if used to draw attention. 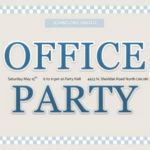 Simple yet effective office party invitation. Communicate the time, venue, location, and payment per head. If the party has no entrance fee you can remove this part from the template. Another basic sample that will work for just about any occasion. This design is 5.5' x 5.5' so get your scissors ready if you are printing on a home printer. Generic red theme that can be used for different types of invitations. 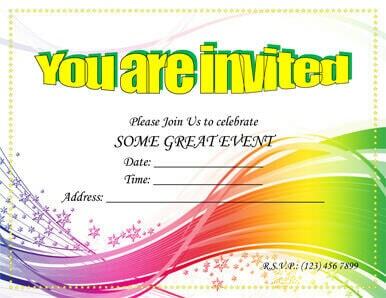 Party invitation for any occasion with colourful design. Three squares to give information about host, time and date, and location of the venue. 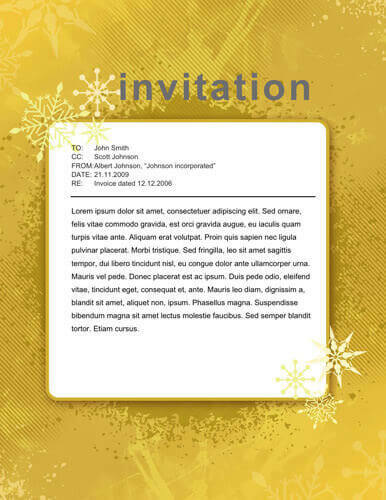 General invitation template that can be used for different occasions: birthday party, dinner, celebration, garden party, etc.